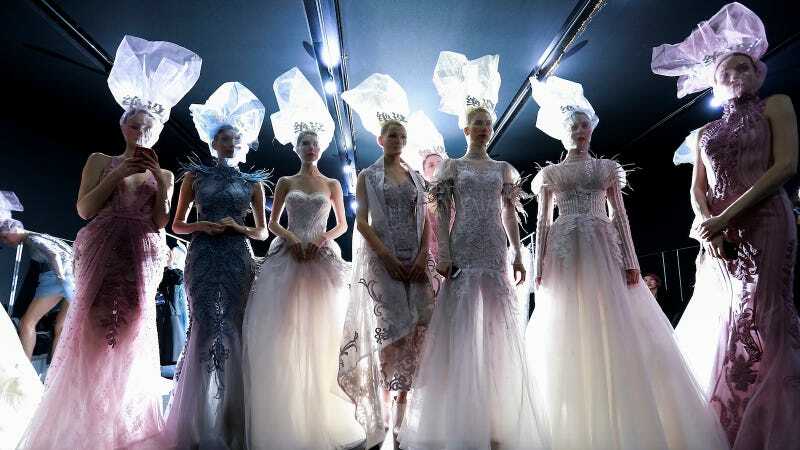 China Fashion Week is presently commencing its eighth day in Beijing, and while much of it was stunning, the most outstanding work has been in the bridal realm. If you have ever looked for something to get married in (I haven’t, but I’ve seen movies) or been to a wedding, you know how difficult this is to do! CFW has a program within a program, and a wedding dress conference show is running concurrently within it. The designers showed a mix of some of the most beautiful princess gowns I’ve seen in ages, including the above diaphanous pieces by Jusere, which are particularly excellent if you’re trying to get married in Frozen. (Hey, weddings are enough of a show to begin with, no disrespect if you complete the circle and get hitched in costume.) The high-up veils give the dresses a more dramatic, avant-garde edge to keep them from being too frilly or saccharine. At Cai Meiyue, traditional red Chinese dresses juxtaposed white ones, all embellished with delicate details like cascading flowers, chiffon ruffles, and elaborate beadwork. Cai Meiyue. Image via Getty. This Zhang Yichao creation weren’t technically part of the bridal showcases, and I were getting married, I would definitely consider dressing like a bleeding heart blossom. Zhang Yichao. Image via Getty. This one, from the Art Hearts Fashion show, is for when your wedding is a rave. Also, please invite me. The designs from Dennis were surreal, ranging from the lightest to the darkest color palettes, and included fantastical applications of chiffon and visible crinoline. This gown is for the more experimental bride, both in its hue and the fact that the skirt is a tangle of licorice. But there’s also something for those with ballerina fantasies. Ying Ma’s AM.IXAM label posited that a train could never be too long, perhaps appropriate if you’re being married on a landing strip. But the richness of the designs up close only emphasized the drama in them. Meanwhile, AOLISHA would have you out here looking like the Queen of England. Truth be told, though, my favorites were Shenbai’s cake-toppers, presumably because I’m a product of the ‘80s. Give me volume, give me tulle! The idea of showing up to your own wedding with your tiddies out is pretty funny, and if you want to do it, you can. It’s your special day. Finally: this look is from Gareth Pugh’s Spring 2017 collection, which he’s showing for the second time in Beijing (he debuted it in London in September). While it’s ready-to-wear, in the context of the bridal showcase it makes wearing something so ostentatious as a Queen of the Damned crown and black slip dress to your wedding seem exactly right. Don’t forget the rain of black rose petals for your big exit. Gareth Pugh. Image via Getty.